which airbrush compressor to buy ??? where to buy airbrush compressor ??? When buying an Airbrush Compressor make sure you check to see that it is rated for the type airbrushing you will be doing. Airbrushing T Shirts, Models whatever. Also make sure it is rated for the type of airbrush you will be using. Very few of these little “Airbrush Compressors” will give you enough PSI to run a VL and use createx paint. (VL requiring 35 to 60 PSI to spray createx effectively) Take the time to read the suggested uses for the compressor you want to purchase and ask questions of other experianced airbrush artist before you buy an new or used Airbrush Compressor. Airbrush or spray gun you have should have recommended pressure and volume requirements for air please be sure the compressor you buy meets or excedes those requirements. It is always a good idea to buy a compressor bigger than your present needs so you have room to grow and so you don’t over work your compressor. The first thing a person should do is decide what their average airbrushing needs are going to be. Before the purchase of a compressor kit, knowing what one’s major uses will be helps them in purchasing the right sized compressor kit. If the airbrushing will only be a hobby, then a smaller compressor will do just fine; but, if they are starting an airbrushing business, such as for automobile detailing or similar, a larger, shop styled compressor is the better choice. The first question often asked is if an inexpensive, relatively low capacity air compressor purchased at your local tire store, or big box store, or even work properly for air brush painting? If so, what are the issues with them? 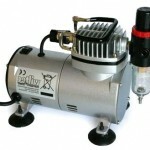 Air compressor, is a device specifically for compressing air to power other tools like airbrush pistol.